4. Setting up Integration without token? AdvocateHub for AppExchange integrates Salesforce with Influitive’s AdvocateHub. This integration syncs a contact's advocate activity in Salesforce from your AdvocateHub. This document explains the process for setting up the AdvocateHub AppExchange with the Salesforce platform. To complete this setup, the AdvocateHub administrator must either have Salesforce administrative privileges or contact your internal Salesforce administrator. 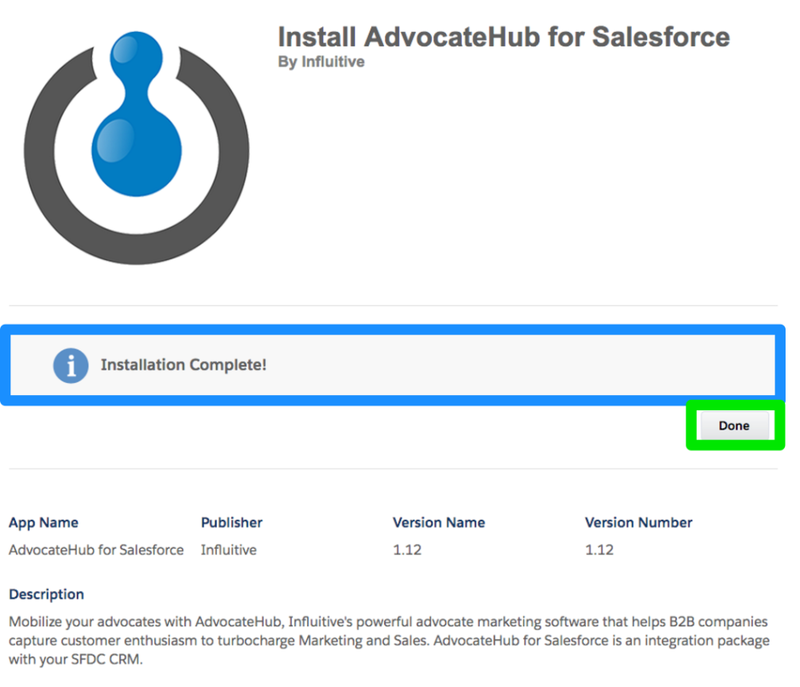 With your AdvocateHub integrated with Salesforce, your sales team will be able to leverage the information collected from advocate activity to enhance the sales cycle. Note: Due to Salesforce.com restrictions, you are required to have "Integration via Web Services API" turned on. This means that you require Salesforce Enterprise Edition or above. Alternatively, if you have the Professional Edition, you may pay Salesforce an additional fee to have this functionality turned on. 1. Login to your salesforce.com account as a Salesforce administrator. 3. Login to your Salesforce Account. 4. Select Install for All Users and click Install. 5. Once Installation is completed, you will see the following message. Click Done and you're all set! Please note that if you wish to install the AppExchange package to a Sandbox instance, make sure that you are signed into the Sandbox instance before clicking on the link to install (as per Point 2 above). Otherwise, it will install to your Production instance. After the AppExchange package is installed, a Salesforce user would need to input their Salesforce username, password, and security token into your AdvocateHub. Your AdvocateHub will use these credentials to create new chatter messages, write advocacy activities to the AdvocacyActivities custom object, and create new referral leads. 1. In the AdvocateHub, click on the cog wheel in the top right corner of the screen and click on Integrations to go to the integration library. 2. Browse through the integration library until you find the Salesforce integration and click Manage. 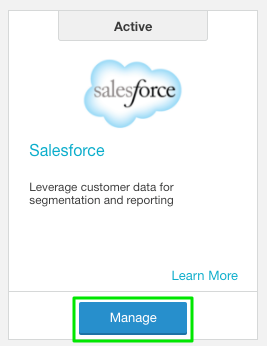 Note: Salesforce for Referrals 2.0 integration is only for lead push. For information on this, see here. 3. To enter your credentials, navigate to the setup tab, enter the Username, Password and Token associated with your Salesforce account. ii. Click on Personal to expand the menu. From this menu, choose Reset My Security Token. iii. Click on Reset Security Token and your new token will arrive in your email inbox shortly thereafter. Here's how to integrate without a token. Hit Save once you are done. If you would like to switch from Salesforce Sandbox to Production, please submit a ticket to support@influitive.com. 4. When you enter your credentials successfully the saved button will turn green and you will now have access to the Settings tab where you can configure each aspect of the integration. Setting up Integration without token? 1. Login to SFDC and go to Setup > Security Controls > Network Access. 2. Add Influitive’s IP address (contact support@influitive.com to acquire the IP address) to the list of trusted IP addresses. It can be both the start and the end of the range. 3. Return to the SFDC integration in the AdvocateHub and enter your credentials (without the token). You may get an error message the first time you save your credentials in the hub as our system is still communicating with SFDC to figure out the connection. If so, please try again and give it a few minutes to authenticate. As this feature of the integration is for Referrals 1.0, you can ignore this section of the integration. For information on pushing leads for Referrals 2.0, see here. 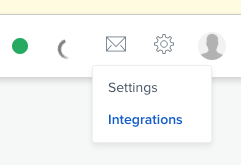 As this feature of the integration is for Referrals 1.0, you can keep this switch toggled to Off. For information on tracking leads for Referrals 2.0, see here. To sync up your Hub with Chatter, switch the button to the On position. To sync your advocacy activities in the Hub with Salesforce, switch the button to the On position. If you wish, you can add a custom SOQL query to specify which data, in addition to matching email address, will need to appear on the contact's record for it to sync with Influitive e.g. Advocate_c = TRUE (this is just an example). If not, leave the field blank and click on Save. 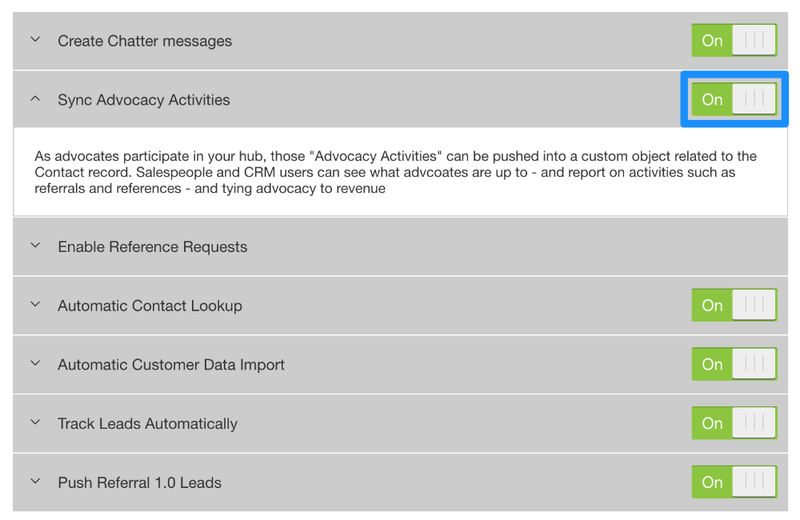 AdvocateHub can import advocates from Salesforce.com on a nightly basis. In this update, new advocates could be created, or existing advocates would be updated with the information specified in Field Mapping. 1. Click on Automatic Customer Data Import and allow the configuration window to collapse. 2. Toggle the switch to On. 4. Set up your mapping so that the Influitive fields match your Salesforce fields. Remember: if you want to add mapping to custom fields in Salesforce, you'll need to type in the API names of those custom fields, not their display names. The integration on the Influitive Hub side is now complete. The next steps outline what you need to do in your Salesforce instance. After installing and deploying the AppExchange package, a Salesforce administrator will need to modify the Opportunity and Contact Layouts. You will need to modify the page layout for Opportunities to display the Request a Reference button and the Contacts page layout to display Advocacy Activities. For further information on modifying Salesforce Page Layouts, please visit this Salesforce Help Page. 1. 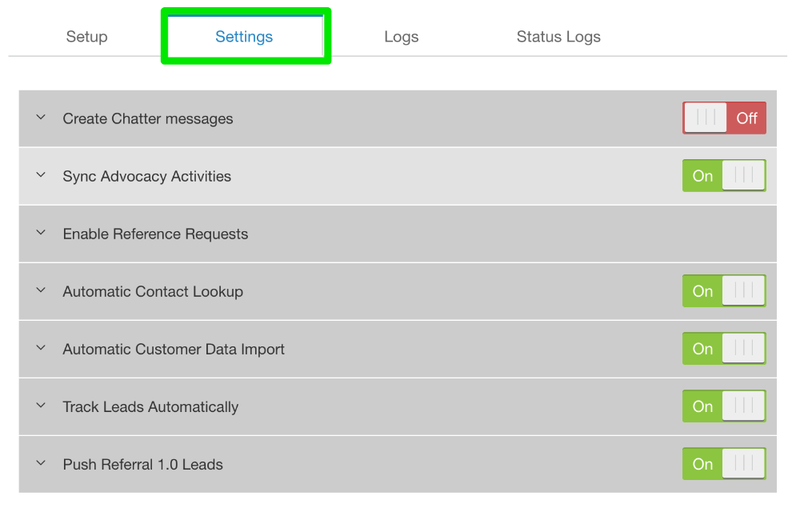 In Salesforce, go to Setup > Customize > Contacts > Page Layouts. 2. Select Edit next to the page layout your Salesforce users use for managing contacts. 3. Select Fields and drag and drop Date Added to AdvocateHub and Date Joined AdvocateHub to the preferred section of the contact layout. 4. Select Related Lists and drag and drop Advocacy Activities to the preferred section of the contact layout. 6. Sort the advocacy activities by Last Activity Date descending. 7. Save the Contact Layout. This section of the contact record displays reference activities and their status for a prospect that has requested a reference. 3. Select Related Lists and drag and drop Advocacy Activities (Prospect) to the preferred section of the contact layout. 5. Sort the advocacy activities by Last Activity Date descending. 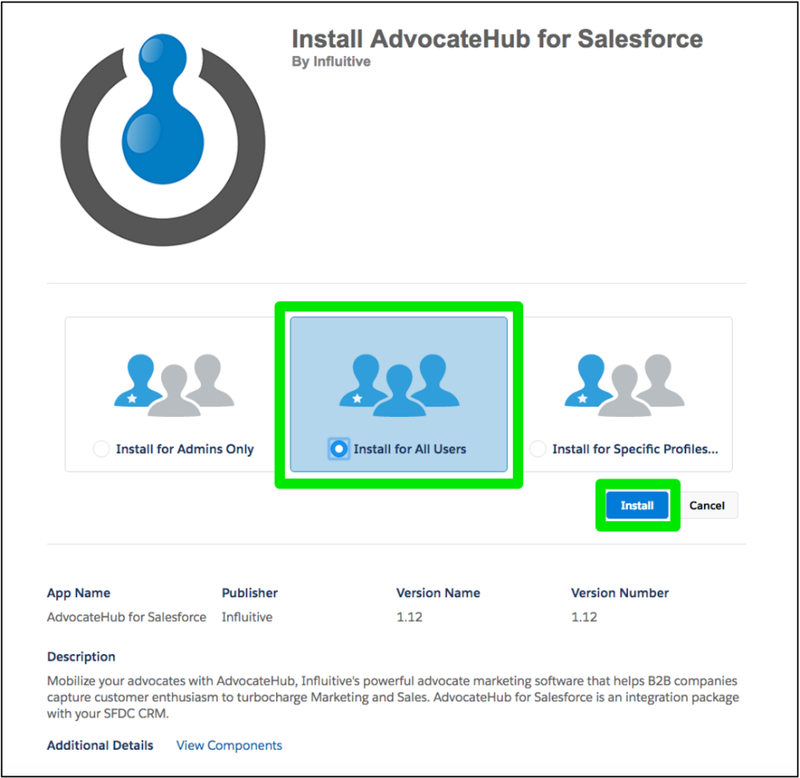 This Visualforce page on the Contact Layout allows Salesforce users to nominate contacts to become advocates in the AdvocateHub. Nominated users will appear in the Nominees list, along with the name of the Salesforce user who nominated them. From there, the AdvocateHub Administrator can choose to send them an invitation to join the program. 3. 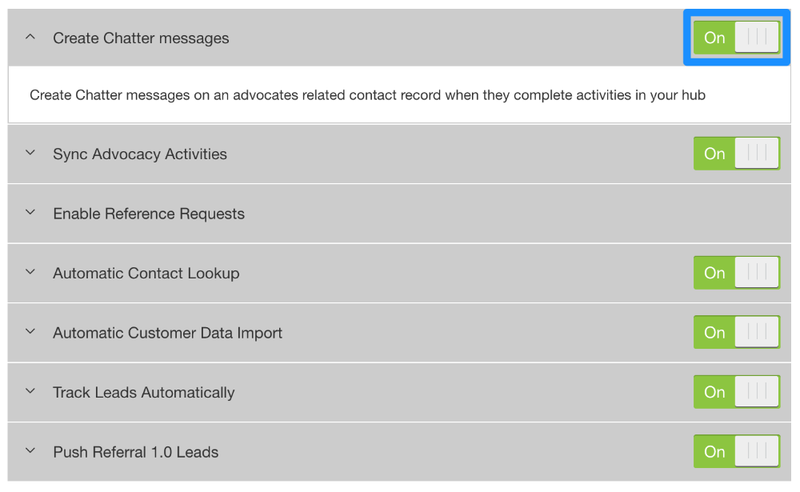 Select Visualforce Pages and drag and drop NominateContact to the preferred section of the contact layout. 4. Save the Contact Layout. This Lookup field on the Lead Layout will allow you to view which Salesforce contact made the referral through the AdvocateHub. If they are not a contact in Salesforce, this field will remain blank. 2. Select Edit next to the page layout your Salesforce users use for managing leads. 3. Select Fields and drag and drop Influitive Referral Source to the preferred section of the Lead layout. 4. Save the Lead Layout. 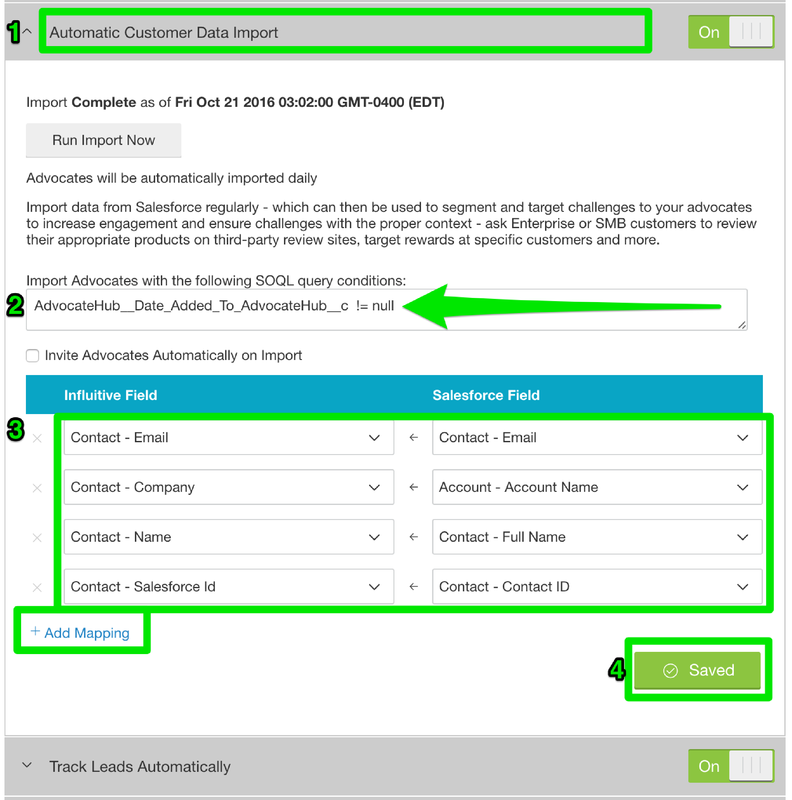 Note: in order for this field to populate, you will need to map this field to the Contact-CRM Contact Id field in the hub when you are setting up your lead push mappings under the Salesforce for Referrals 2.0 integration. For more information, see here. The Request a Reference button allows sales agents within Salesforce to request a reference for opportunities currently in the sales cycle. You can check out this article for more detailed information on this feature of the package. 1. In Salesforce.com, go to Setup > Customize > Opportunities > Page Layouts. 2. Select Edit next to the page layout your sales team uses for managing opportunities. 3. Select Buttons and drag the Request a Reference button to the custom button section of the opportunity layout. 4. Save your changes to the opportunity layout. When an advocate suggests a contact in a referral form, the AdvocateHub automatically creates new leads in Salesforce with the name of the advocate in the Influitive Referral Source lead field (if they are a contact in Salesforce and the field has been mapped in the hub). It would be a good practice to map this field to an account field or opportunity field in Salesforce to close the loop on an advocate's referral activity. 2. Click on the Map Lead Fields button.